On recent forays into YouTube territory I noticed the gazillion cover versions of well known hits. I mentioned this to son No.3, when he was home one weekend, and he informed me that yes, YouTube is most definitely filled to the rafters with amateurs belting out covers of just about everything, and had I just noticed this? I’m miserably behind when it comes to all things internet. For instance, on first starting up this blog I would sit there, wracking my brain, trying to come up with something/anything to write about. Eventually a little light bulb would come on, about an inch above the old noggin, and a riveting post would appear, after much research, editing and spell checking (my own, not WordPress.com’s, which thinks in American.) Feeling pleased with myself that I, and I alone, had come up with internet gold, I would type my post subject matter into Google to find that roughly a million other people had got there before me. And so it is with the song cover situation. Because a couple of months ago I began thinking wouldn’t it be nice to record some songs, put them onto my invisible blog and break things up a bit. And wouldn’t it be better to go with songs people already know, since I lack genius song writing skills. The light bulb came on, above my just turned 55 head, and I thought maybe YouTube has karaoke versions of popular songs to sing along to, so off I went, to discover that the entire world had had the same idea. Undeterred, I decided to give it a go anyway and further questioned Son No.3 re: cover songs, beginning with how did I get my mitts on a karaoke track, in order to be able to sing along to it and actually record the whole thing. To my astonishment (but Son No.3 was adamant that literally EVERYONE knows this) he rapidly converted the karaoke track I wanted from YouTube to an mp3 file and then downloaded a free audio software package, to this very laptop, called Audacity (according to Son No.3 EVERYONE knows Audacity, except me) and then moved the mp3 track into Audacity , where I would be able to sing over the top of it. I find this state of affairs remarkable. 33 years ago I paid (or my parents probably paid) for time in a recording studio, in Liverpool, to record 8 songs I’d written whilst at uni. The recording studio was dismal, dark and contained a rickety old upright piano. I played the piano a bit, and strummed a guitar a bit and then sang, perched on a wooden stool, into a microphone on a stand, whilst a young lad sat behind a glass panel recording the whole thing and mixing the piano, guitar and vocal tracks. The process seemed to take a very long time and felt like hard work. The end result was a MASSIVE reel enclosed in a cardboard box and the forking out of £70, which back then was probably roughly equivalent to a million. And here I am in 2016, with the ability to record stuff at home, on a tiny laptop, for (almost) FREE. Unfortunately a certain amount of cost was involved, and the process also involved a lot of trial and error. The first thing was to buy a microphone. 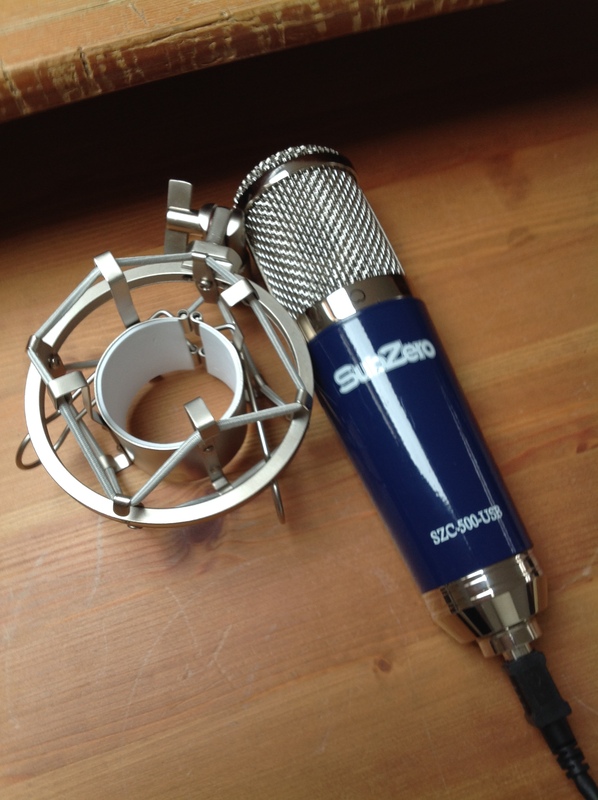 I got a SubZero SZC-500-USB condenser microphone for £45 which came with a stand. This seemed pretty cheap and, as I’ve now realised, is probably too cheap to get a really good sound (YouTubers seem to go with Rode mics costing over £200) but no point breaking the bank when it comes to songs for the blog that no one reads. The next thing was to get a very cheap pop shield filter, which cost £6. This filter supposedly blocks all the clicks and pops and hard consonant sounds which ruin your average recording. It kind of worked in the end, I think, but there’s still quite a lot of clicking going on. But onto the recording. I plugged the mic into the laptop and things seemed to go ok until a few days later I started getting a horrible thumping and hiss, along with the vocal track. The husband decided the laptop’s inbuilt microphone was interfering with the USB mic and disabled the laptop mic. The problem was fixed instantly – hurray for the husband. Audacity allows you to record as many tracks as you like, which overlay on each other instantly – is it just me who thinks this kind of thing is miraculous? It comes with all kinds of effects and tools to edit your tracks. I didn’t use any of them, being as I couldn’t be bothered to learn how to use them, preferring to sing the tracks all in one go and see how it turned out. I did add the ‘echo’ effect once, which turned out to be absolute rubbish, so didn’t use it again. I went with simplicity – just voice and backing track. I spent two weeks messing around on Audacity, during which time I found that sound recording can be a real pain, due to the fact that everything gets recorded; to the sound of your next door neighbour’s washing machine; to the creaking of your kitchen chair (thought the kitchen would lend acoustics); to the tinkling of the microphone; to every little clearing of your throat, particularly when you’ve got a head cold. I remedied these by not holding the microphone and making a home made mic stand from a cereal box (not wanting to go to further expense.) The mic came with a stand that wouldn’t sit on a table owing to the fact that the mic lead had nowhere to go, so I cut a hole in a cereal box, sat the mic on top, fed the lead through, then placed the box on some very thick books, leaning the shield against the mic. I then used the loft as a recording studio being as it’s away from neighbourly noise and has softer, non creaking chairs. The loft is also the husband’s den. That massive thing to the left of the mic is an electrical testing gizmo. You can see Yoda was watching the recording session to the right. I sang 5 melody lines for about 30 minutes and then saved it as a project file. I then had to research how to get that file onto here, without having to create a soundcloud account etc. The answer was to export my audio file to a WAV format and then upload that. However, after consulting Son No.2, I was advised to download free software called LAME, which let me convert my Audacity track to an mp3 file, which would compress the original file to more manageable proportions. I’d like to add that the dreams in which I’m dying are most definitely not the best I’ve ever had, and that I very rarely drown my sorrows. Still have a copy of the tape — if I could find it.